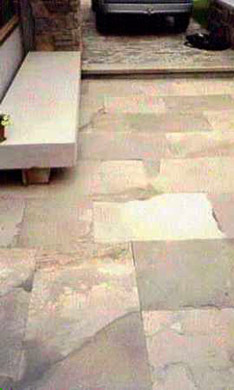 Square cut flagstone is used in a side walkway area in this photo. Installing the flagstone is a little more labour intensive than other paving materials, but the finished product is well worth it. A three thousand pound cut stone bench that was installed adjacent to the building nicely fills the area and adds just another spot to admire the gardens. Beyond the flagstone area is a small driveway constructed of granite settees. These were originally round boulders that were guillotined into rectangular shapes. These granite settees were reclaimed from the original landscape.